Debbie Aguiar is responsible for spearheading the overall growth and direction of Eventus’ sales initiatives, client development, strategic partnerships, and customer acquisition. Debbie brings vitality, professionalism and a mindset of service to her work with clients and understands how to leverage experiential, cutting-edge trends in technology, traditional and digital media, communications, branding and research to strategically position a brands. Prior to joining Eventus, Debbie served as Sr. Director of Advertising and Marketing at the Miami Herald Media Company (MHMC). In this capacity, she worked with clients such as Macy’s, Publix, Walmart, Best Buy, and Target to meet their advertising goals by building cross media programs for both General and Hispanic market. 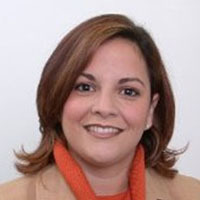 Additionally, she oversaw all marketing functions for The Miami Herald and El Nuevo Herald and their websites (mh.com, enh.com, miami.com, momsmiami.com and dealsaver.com). Prior to this, Debbie served as General Manager of Herald Events, where she was responsible for creating, identifying, evaluating, and negotiating sponsorship programs for MHMC. Before joining MHMC, Debbie was Director of Conference at LatinFinance, a Euromoney publication.